The Collab Blog: Have you seen the 214Ready Blog? Check it out! Do you want to be inspired by the ways that students are preparing for their future in District 214? We suggest you check out the 214Ready Blog to learn about the many ways that we collaborate with students, parents and the community to insure that students are college, career, and life ready when they graduate. This week's post is on the Power of the Hashtag, showing how Social Media can multiply our opportunities to showcase learning in action and build connections and community across the district and beyond. Check it out! 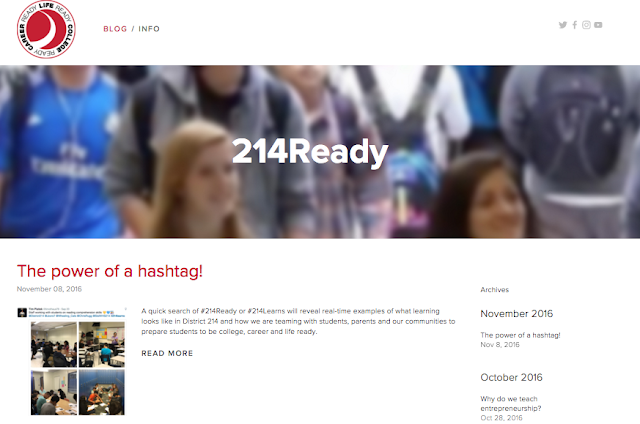 And, if you have suggestions for the 214Ready blog please contact Linda Ashida or Jen Delgado.